I have been keen to understand what kind of articles are read, and written, in Tamil Wikipedia, and Wiktionary. So it was time to use data analysis and some programming – so thats what I did! Last weekend I tried to take Open-Tamil Python library for a spin with the dumps of Wikipedia data for Tamil wiki and here are results. Download the file solpattiyal.py from the above link, or get whole of open-tamil from github. Finally we use the sorted() method in Python with the comparator key to print list by frequency, and again we print it by sorted order. Code is written in particular way to straddle both Python 2.7 and Python 3. This analysis is not a criticism of Tamil Wikipedia. I am a Tamil Wikipedia contributor in last several years, and Wikipedian circa 2005. Sample data from my analysis of recent Wikipedia title dump file yielded some interesting data on Tamil wikipedia article distribution. The data file can be found in common-words-ta-wikipedia-data-March-16-2015. You can think of contributing 1 article every month!! Feel free to improve on this code, and send a pull request in github. 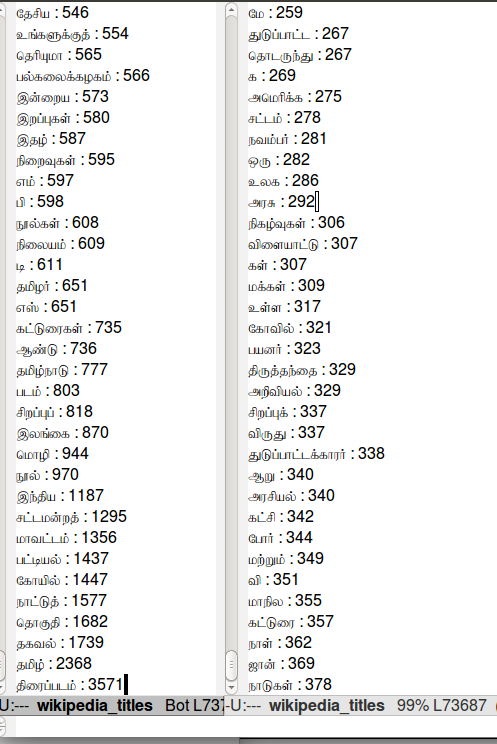 க்கத்திற்கு 2014ம் ஆண்டிற்கான கனடாவில் இயங்கும் இலக்கியத்தொட்டம் வழங்கும் “தமிழ்க் கணிமை விருது” க்கு தேர்ந்தெடுக்கப்பட்டுள்ளார்.. அவருக்கு வாழ்த்து தெரிவித்து தமிழ் மொழி, அதன் எழுத்து, நிரலாக்க மொழியின் தேவை போன்ற பல கோணங்களில் கேள்விகளை கேட்டு பதிவு செய்துள்ளோம்.. தங்கள் கருத்துக்களை தெரிவுக்கவும் ..
இதை http://www.ezhillang.org இல் வேகுவில் நிறுவு முனைகிரேன். அதுவரை ஹஸ்தா-ல-விஸ்தா! தமிழ் இணையம் வழி சொல் திருத்தி: வானி http://vaani.neechalkaran.com இன்று ஒரு வேளியாகியது. நண்பருக்கு வாழ்த்துக்கள்.